Our annual food drive involves all five of the district's schools in a friendly 3-week competition that stocks up the food pantry run by the Basic Needs program at Montague Catholic Social Ministries in downtown Turners Falls. 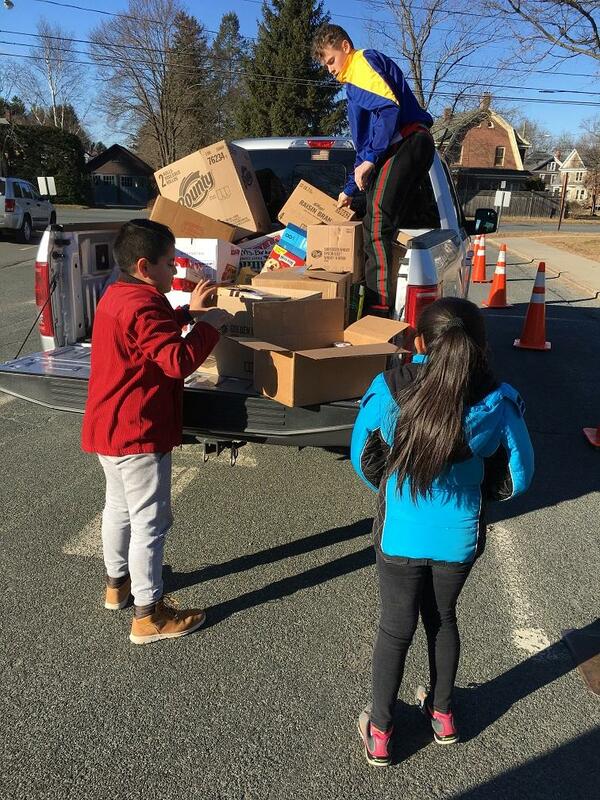 This effort is led by parent volunteer (and former school committee member) Lesley Cogswell, with help from students, staff, families, community members, and the Gill-Montague Community School Partnership. Items were collected, counted, and delivered to MCSM on three Friday afternoons. 942 items deliverd to MCSM this week, for a grand total of 2007! Sheffield Elementary contributed 472 of those items, and the 3-week total from Sheffield was 928! Great Falls Middle School had the 2nd-highest overall total - 646 items. Sheffield, GFMS, and TFHS all beat their totals from 2017; Turners Falls High School almost quadrupled theirs! This week's helpers included Student Council representatives from the 5th grade at Sheffield and a TFHS student. Thank you to everyone who donated, and everyone who helped. 577 items delivered to MCSM this week, for a two-week total of 1065! We had to discard approximately 100 items this week because they were expired. Please check the dates on your items before you send them in. Sheffield Elementary is the overall leader so far: 456 of the 1025 items that have been delivered to MCSM came from Sheffield! Gill Elementary is planning to send in everything they've collected on Dec 14. This week's helpers included Student Council representatives from the 4th and 5th grades at Sheffield, an 11th grader from TFHS, and GFMS/TFHS parent and MCSM Board member Geralyn Johnson. 484 items total delivered to MCSM so far! Fourth grade student council representatives from Sheffield helped out with loading, unloading and delivery on November 30th. We had to discard over 100 items on pick-up day because they were expired! Please be sure to check the dates on items you send in for the drive. Sheffield has collected the most items so far - 224 in the first week. Great Falls Middle School was 2nd with 148. Hillcrest and Turners Falls High School also started off strong -- their Week #1 totals for 2018 surpassed their Dec 1 totals from last year's drive.